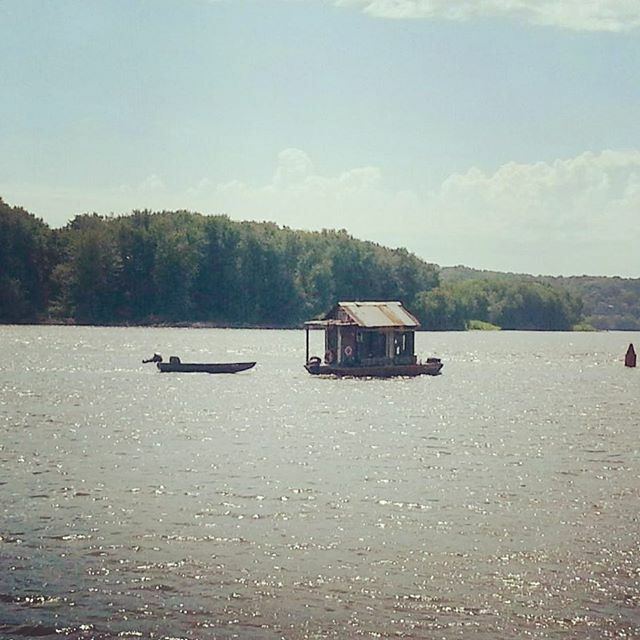 #Shantyboat spotted in Dubuque. River coincidence: this photo was sent to someone downriver who I ended up interviewing two weeks later. Dubuque Telegraph Herald: River exhibition will dock in Dubuque National Mississippi River Museum in Dubuque Shantyboat Near Dubuque, Iowa [VIDEO] Rediscovering our secret cache of Dr Thunder’s Peachy Fire Whiskey during a shantyboat workday. #shantyboat #secrethistory #firewhiskey Vintage 1880s albumen photo of a young family living on a houseboat Reddit: I am an artist spending the summer in a shantyboat on the Mississippi River gathering stories of river people. AMA! ← Downtown Clinton #Iowa looks like an economic bomb dropped on it. On the other hand, #Walmart is doing a brisk biz in the edge of town. #Shantyboat #lowerwagesalways ← #Shantyboat underway in Clinton Iowa.